Glass frogs are found in the rainforests of Central and South America and remain one of nature’s more fascinating oddities. It’s name perfectly matches its physical appearance, with translucent skin so clear you can see the frog’s organs. The lack of pigmentation that allows us to see the glass frog’s heart pumping and innards hard at work is a mystery to scientists, but they are an impressive sight nonetheless. Photographer Jamie Culebras recently published a stunning series of new photos of a female glass frog that appeared in the Daily Mail. Culebras was making an inventory of amphibians and reptiles in the Mashpi Reserve in Ecuador when he came across the female glass frog. 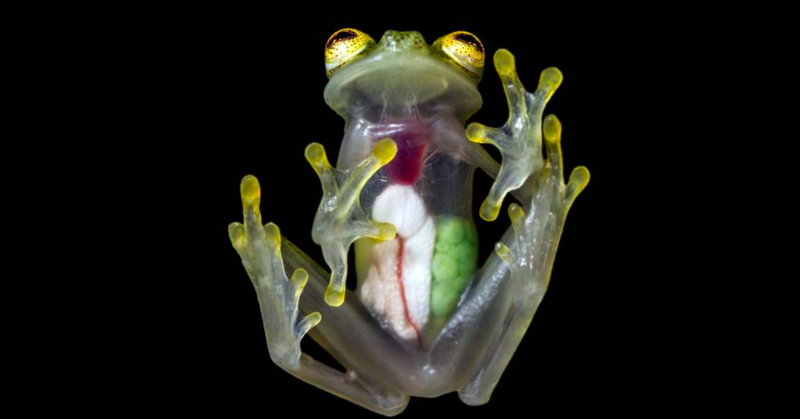 “In the picture you can see perfectly the internal organs of the glass frog,” Culebras told the Daily Mail. What makes these new photos so noteworthy is the fact that you can see the eggs of the female growing inside her. Glass frogs, unlike most other frog species, do not abandon their eggs and instead, the female lays them and the males carefully stand guard over the eggs 24/7. The males ward off predators until the frogs hatch into tadpoles. Male glass frogs are also extremely territorial and will fight other trespassing males.